Vitamin drips infuse your body with pure vitamins, hydration & electrolytes, directly into the bloodstream for full absorption. When you need a little boost to heal or feel better, our proprietary vitamin iv drip infusion formulas can be a lifesaver. Our vitamin iv infusions help to prevent a cold or flu, regain your energy and mental focus, brighten your complexion, boost collagen, your fat and calorie burning power and help rebuild muscles for athletic performance. Vitamin drips are much more effective than taking oral supplements due to the fact that vitamin supplements get diminished in the GI tract, and thus do not get fully absorbed. With a vitamin drip, key nutrition is delivered to your blood for immediate and full absorption. The result? An instant, noticeable improvement in overall body and mental function. In the 1980s, Dr. Myer’s studied 15,000 people who were ailing from common conditions such as allergies, asthma, migraines, cold/flu/fever, chronic fatigue as well as more serious conditions such as depressions, fibromyalgia, cardiovascular disease, respiratory disease, narcotic withdrawal, as well as athlete and peak performance. Dr. Myers then developed and tested a “cocktail” of vitamins to be infused in a saline hydration drip-which is the very first thing a hospital does upon an intake of a patient, for infusion at regular intervals. The results were staggering, helping thousands of people feel better, perform better and gradually, but drastically improve their health over time. Thus the term “Myer’s Cocktail” developed. At La Reine Spa, we have elevated the Myer’s Cocktail base of formulas to include even more vitamins, nutrients, minerals and hydration to give our clients even better of an outcome for the average lifestyle. Reduce the healing time of a cold or flu. An iv does have to enter your vein for access, so at treatment onset you may feel a slight bit of pressure at entry point, however that feelings lasts less than a few seconds long. As the hydration and vitamins infuse, you will feel no pain whatsoever. With a shot, you may feel a slight poke or bit of pressure, but the shot will be over before you feel any pain. No. You may go back to work, your workout or travel plans immediately after a vitamin therapy treatment-in fact its recommended to receive vitamins before a workout, travel or work. The vitamins will give you the energy and mood boost you need to get through your day and feel naturally energized, productive and ready to crush your workout. Typically no. However small and minor risks include bruising or pain at the injection site. More serious complications, though very rare can result in scar tissue in the vein from too frequent use of the vein. Typically no, as the vitamins we use are water soluble. Meaning your body will absorb what it needs, and pass what it does not. So naturally your body will pass the extra vitamins through. We do limit the amount of times clients wish to receive vitamin therapy overall as too much fluid in the body can be dangerous. This is also why you will want to make sure your vitamin iv center is doctor supervised and a nurse practitioner is monitoring your treatment progress as we do at La Reine Med Spa. When Will I Experience The Benefits from Vitamin Therapy? Often our clients remark feeling better within a few minutes, and even remark that they can taste the vitamins. Most clients feel the effects of the vitamin therapy within a few hours and up to one week post treatment. How Often Should I Get Vitamin Therapy for Great Skin? Many seek out our vitamin therapy to help improve their overall skin appearance, and even lighten their skin tone (which is possible through our High Dose Glutathione and Vitamin C drips). We typically recommend our vitamin therapy to be received as needed. Many opt for packages of 6 or 10 for regular appointments to keep their health aligned. How Often Can I Get A Vitamin Treatment? We recommend that you receive our vitamin drips as needed; if you feel tired, sick, hungover, or just plain “blah” our vitamin drips can come to the rescue. If you are very sick, you may receive up to 2 liters of fluid, in the course of one week. If you prefer to have a regular regimen of treatments, we would recommend no more than one IV per week. For shots, we typically recommend no more than twice per week. Absolutely. It is recommended to receive one of our vitamin drips when feeling depleted. Anyone who has a normal healthy lifestyle may receive our drips. In addition those who are feeling ill or ailing may also seek relief with our drips. Those with kidney failure or high blood pressure may not be good candidates for our vitamin drips. Anyone can receive a vitamin injection however! 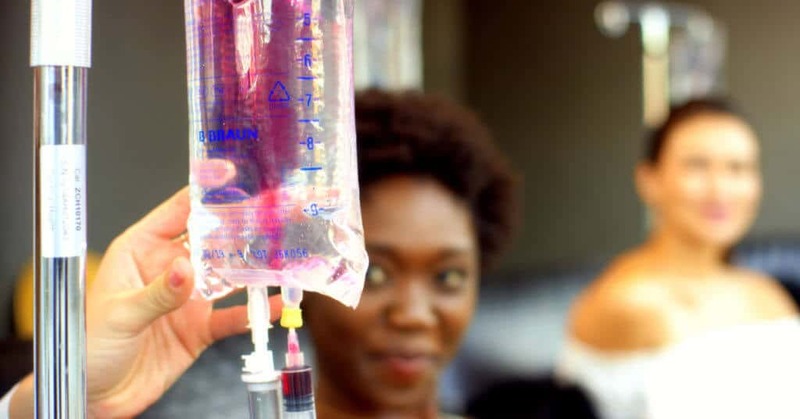 At La Reine Spa, we respectfully decline vitamin IV drip treatment for anyone younger than the age of 16 and those undergoing active cancer therapy; however vitamin injections are suitable for nearly all cases and health backgrounds. What Is The Difference With The Items on Your Menu? At La Reine Spa we carry over 50 different formulations of IVs, shots and push to provide our clients with options that suit their needs and lifestyles. Many clients ask which should they choose? Our most popular IVs are VIIV (Very Important IV) which contains all of the vitamins we carry in stock. Life Repair which contains maximum doses of ALL the vitamins we carry in stock. In addition, many are fanatics of our Hangover Heaven, High Dose Vitamin C, and Chill Pill Migraine Relief Vitamin Drips. Our most popular shots are B12, Cold Buster and Athlete’s Retreat. Our most popular push is our Brighten Up Push which is ideal for immunity, skin health and wellness. We suggest the 1 liter bag of vitamins, however we also have half liter drips for those who are smaller in frame or weight, or those seeking a faster iv drip. For athletes, we recommend our Athletes Retreat IV which contains Amino Acids, Lactated Ringers as well as a Myer’s cocktail base. For those looking for Skin Nutrition, we recommend our Brighten Up IV which contains high dose Glutathione and Vitamin C as well as B12. For those on a budget, you may choose our Simple Saline Drip which is just pure hydration and no vitamins. You can’t go wrong with any of our iv choices however. May opt for a package of IVs and choose a different iv each time. What Makes La Reine Med Spa Different? We are here to serve our clients with the absolute best experiences & results. Our locations are beautifully and luxuriously appointed. We welcome you to visit our facilities for a Free Consultation.